A Wedding Reception is much like a film production. 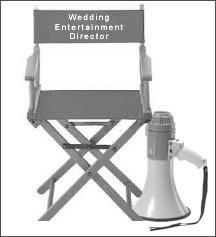 As your Wedding Entertainment Director™, Alexander will transform the “script” of your reception by taking care of the “behind the scenes” details, coordinate with the venue staff, photographer and videographer to ensure the successful result of your reception. Once the planning sessions are completed, Alexander sends the timelines to all the other key wedding vendors such as the venue, caterer, your photographer, videographer and anyone else that needs to know what is going on at the reception so that way, everyone will be on the same page. Alexander will control the content and flow of your reception and make sure the setting is correct and all of the VIP’s are in place before a formality takes place. The wedding day is stressful enough as it is. Imagine what it would be like just to be able to sit back, relax, and enjoy your time with your friends and family while Alexander takes care of the details at your reception. Book an Entertainment Consultation with Alexander!